Woo! I have surivied my first week of returning to University life. For some reason the first week is always the longest; lectures seem to drag out longer and times seams to stop at exact moment you walk in to a tutorial. Sigh… first world Student problems I guess. This week while on one of my lunch breaks I think I saw the scariest lot of sandwiches in my life. Yes, I said food was scary and I will explain why. I am a germ freak, I cannot stand to have anything that is not doubled cleaned and sprayed with disinfectant. I think the greatest invention of the 21st century (beside the internet) is the sanitising hand bottles and cleaning wipes. I am particular fussy when it comes to kitchen matters were I often overdose on cleaning detergent in order to clean my equipment. Any way back to the sandwiches, facing me was a wall of pre packed wrap and sandwiches which did not have the fake plastic look but looked as if they have been in there for more than just that day. Beetroot staining the daylights out of white bread and barely held together wraps made more flaccid by tones of sauce. Worse part was the fridge which they were sitting in had traces of dirt and slightly smelt of wet bread. Lovely… I think I might skip lunch today. During the hour rush of lunch, I think all them were snapped in a matter of mintues and I am taking even the worst looking lunches. I guess when University students are hungry, we would eat anything I guess. Lucky packing a bento from home saves my cravings, yes even I a grown up packs a cute dog shaped lunch box (complete with matching fork, knife and spoon). 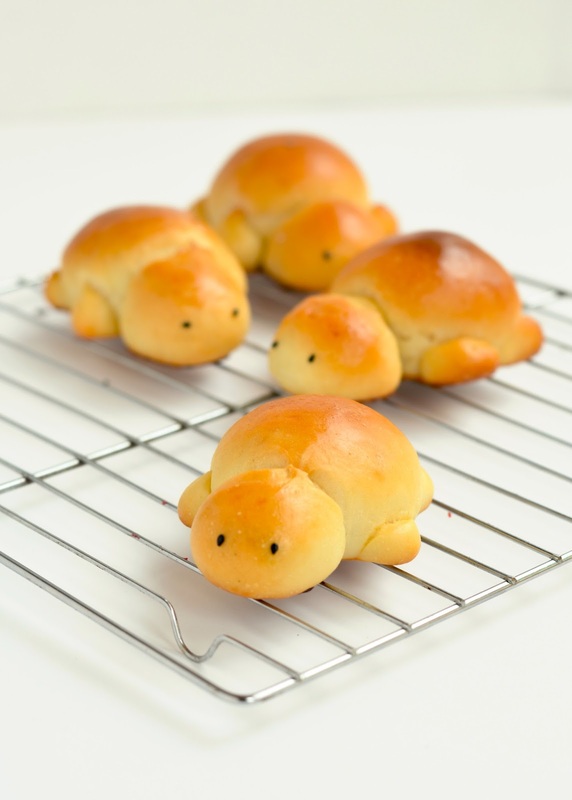 On that faithful day I pack one if these cuties in my bento. Sweet milk bread, which is the base of many Asian bakery rolls; I think is also call Hokkaido milk bread to the Japanese. Light as air white bread, which sweetened with a combination of sugar and condensed milk. I am not sure why it is call Hokkaido, from reference it refers the type of cream or milk used in the bread, which has a higher fat content. This type of bread dough is very easy to work with meaning different shapes can be made. 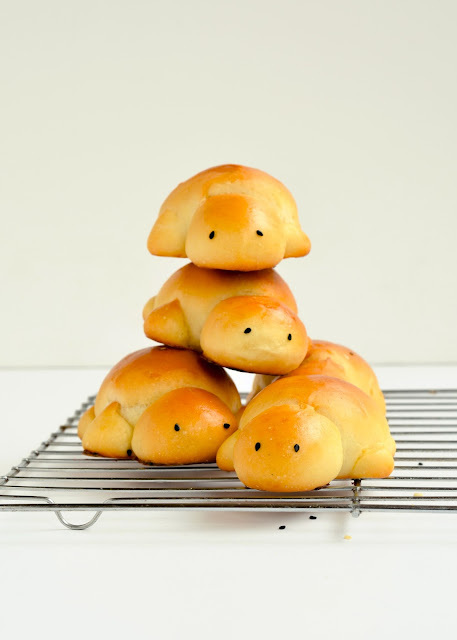 If you have seen my other bread baking adventures, I am obsessed by shaped breads. Turtles this time, what next? Fishes? Cats? Dogs?? Soft milky buns are nothing to be afraid of especially when shaped as small animals. Give it god this weekend with your kids or mates. 1. Put milk, condensed milk, egg, flour, milk powder, salt, sugar and yeast in large bowl. Either with a stand mixer or by hand, Knead the dough until it is rough ball. 2. After knead in the 30g butter, continue to knead until it is smooth and bouncy. It should pass the window pane test. Grease a clean bowl and place dough in it. Cover and leave to rise for 1-2 hours. 3. Punch down and divide into 18 balls, save the remaining for turtle decoration. 5. 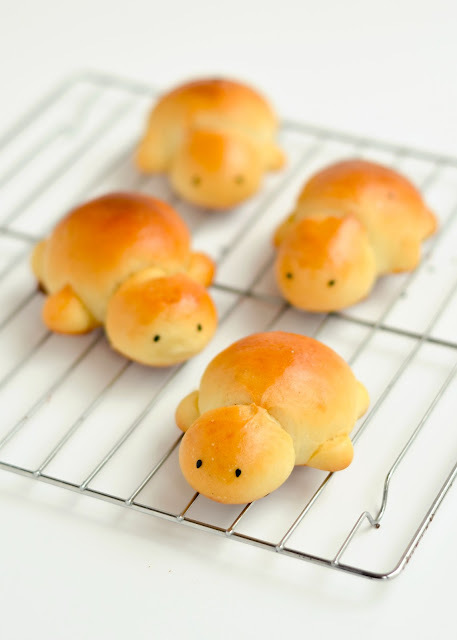 To make turtles divide a small amount of your left over dough into 3 balls. Save one ball for the head. With the other two divide in half with a knife (these will make the legs). 6. To stick them pinch the balls to the large dough ball you divided earlier. Continue until you finish all the dough. 7. Cover and leave to proof for 45 minutes. Pre heat oven to 180c. 8. Brush with egg wash and place sesame seeds for eyes on the largest dough ball ( head dough ball). 9. Bake for 20mintues or until golden brown. Remove from tray to cooling rack. 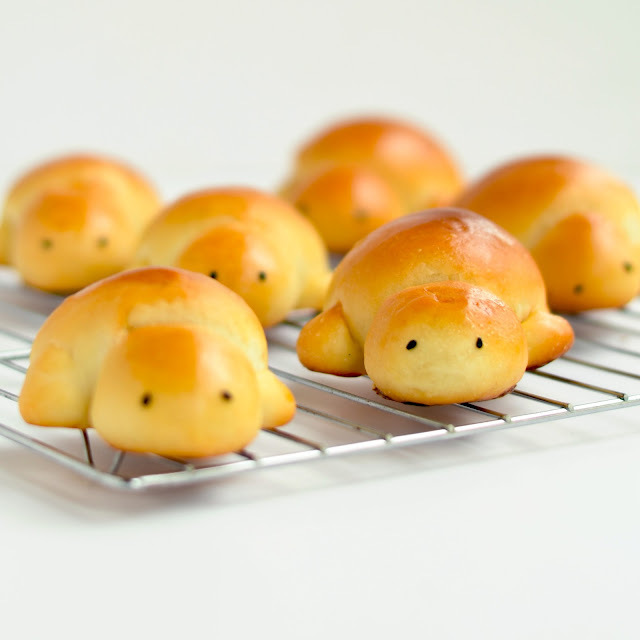 They are really cute to eat! Could these be any more adorable? Love, love, love. Thank you Kristin. I am great admirer of your blog and it means so much to me that you like them. Give them a try. You will not be disappointed. these are so cute! and uni food courts are just gross, the sushi and sandwich bar is absolutely gross and waiting for food poisioning to happen! I know! I think one of friends were so grossed out by some things, she almost had to be sick. Thankfully we have great breads liek this to save us. You make 18 buns small enough to have left over dough. Tehse are very small buns so if you have bigger bodies you may need reduce the amount of turtles you make. One more question, in the ingredients, you said condensed milk but in step 1, you said mix in whipping cream. Which one do you use? 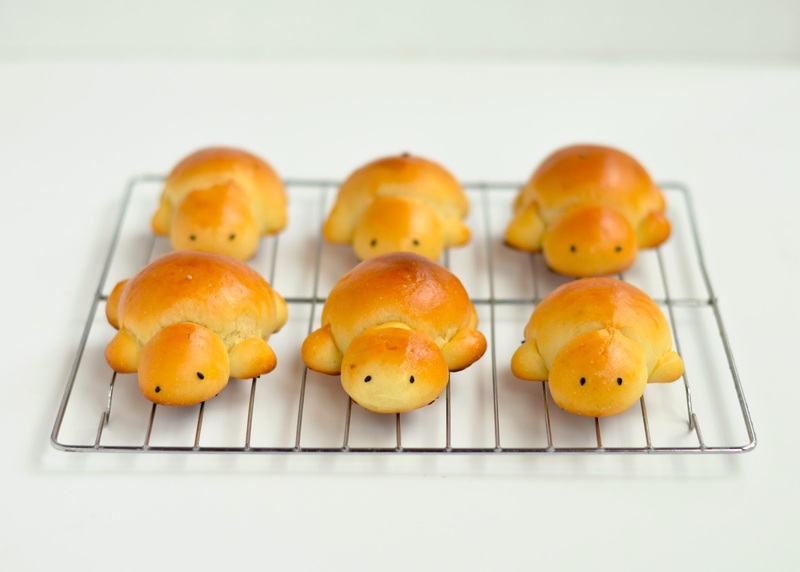 I will definitely make these turtles this weekend! 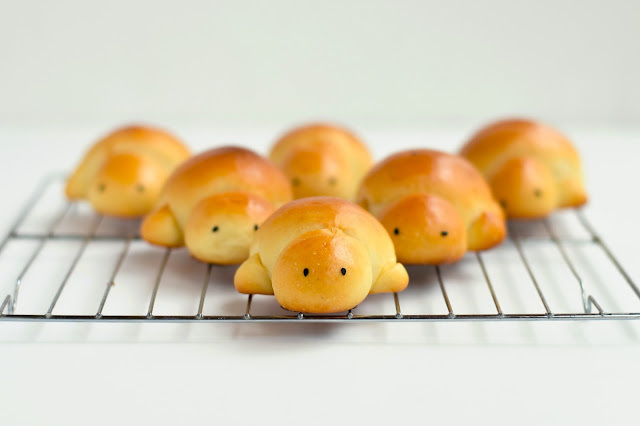 The rolls are adorable! I like the idea to use little black sesame seeds as eyes very much. Luckily I still have some black sesame left, so I can try them soon! 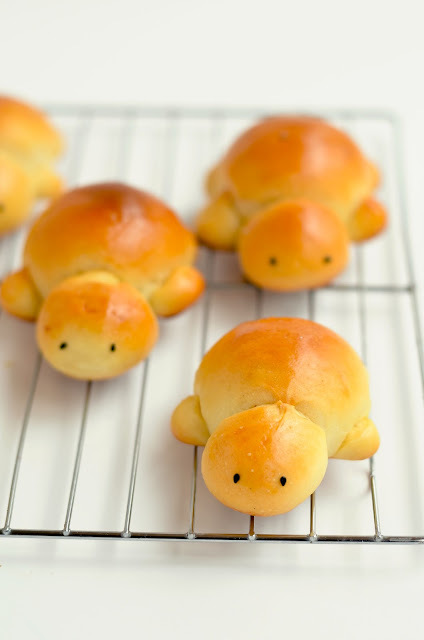 I have prepared this evening the turtles and they are adorable, and the buns are delicious! Thanks for the recipe.